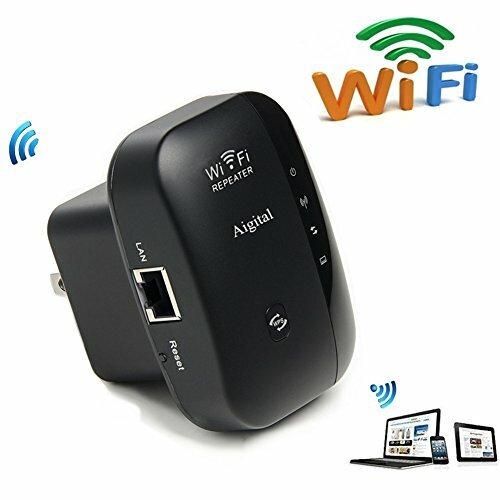 This small WiFi Extender could easily boost your wifi range to let you have a more vast network coverage so you can surf the internet more conveniently. 2. If you set it as a Repeater, please note its passwords must be exactly same as your home wifi passwords, otherwise there will be no internet to get access into. If you have any questions about its function or configuration, please feel free to contact with our service team via email "aigital@163.com" any time, we are online for you always. Thank you!  NO NETWORK DEAD ZONES: Our repeater with built-in new chip and integrated antennas could easily extend your wifi range and achieve local area network coverage.  UNIVERSAL COMPATIBILITY: This small extender complies with the IEEE 802.11n/g/b standard and its wireless network transmission speed is up to 300Mbps,support 2.4GHz network.  WPS FUNCTION: Our repeater supports one-touch wireless security encryption with its wifi protected setup (WPS) button, let you get access into internet safely.  EASY SETUP AND CONNECTION: Convenient Plug-Wall design makes it easy to configure and connect stably.